A new method to grow rice could save hundreds of billions of cubic metres of water while increasing food security, according to a new WWF study. The system of rice intensification method, or SRI, has helped increase yields in some countries by as much as 30%. Tripura, India – A new method to grow rice could save hundreds of billions of cubic metres of water while increasing food security, according to a study by WWF published today. With a focus on India – a country which faces a major water crisis, yet has the world’s largest rice cultivated area – the study found that the system of rice intensification (SRI) method has helped increase yields by over 30% — four to five tonnes per hectare instead of three tonnes per hectare, while using 40% less water than conventional methods. The system is based on eight principles which are different to conventional rice cultivation. They include developing nutrient-rich and un-flooded nurseries instead of flooded ones; ensuring wider spacing between rice seedlings; preferring composts or manure to synthetic fertilizers; and managing water carefully to avoid that the plants’ roots are not saturated. The method was initially developed in the 1980s in Madagascar and has been demonstrated to be effective in 28 countries. “Although the system of rice intensification has shown its advantages, the scale of its use leaves much to be desired,” said Dr Biksham Gujja, Senior Policy Adviser at WWF International. The report suggests that major rice-producing countries — such as India, China and Indonesia — convert at least 25% of their current rice cultivation to the new system by 2025. This would not only massively reduce the use of water but also help ensure food security. In addition, this will reduce significant amount of methane emissions. SRI fields do not emit methane as is the case with the more conventional system of growing rice. For example, if the SRI method was applied to 20 million hectares of land under rice cultivation in India, the country could meet its food grain objectives of 220 million tonnes of grain by 2012 instead of 2050. Authorities in the Indian state of Tripura have already committed to move in that direction. “Our farmers proved that the system of rice intensification improves productivity and we will convert at least 40% of our rice cultivation using this method over the next five years,” said Manik Sarkar, Chief Minister of Tripura State. Demand for a water-intensive crop such as rice is expected to increase by 38% by 2040, deepening the water crisis during the same time. However, less than 6% of rice is traded internationally and savings in water have potential for mitigating domestic water conflicts, especially in poor, rural areas where water is scarce. Already 1.2 billion people have no access to adequate water for drinking and hygiene. WWF is focusing on sustainable agriculture efforts for cotton, sugar and rice, some of the most consuming crops for which alternative techniques can result in a strong yield and water savings. • The report More Rice with Less Water was released today at a conference held 3-5 October in Tripura. The conference is being jointly organized by the Department of Agriculture of the Government of Tripura, the Directorate of Rice Research (DRR), the Central Rice Research Institute (CRRI), the Directorate of Rice Development (DRD), the Acharya NG Ranga Agriculture University (ANGRAU), the National Bank for Agriculture and Rural Development (NABARD), Sir Dorabji Tata Trust (SDTT) Mumbai and World Wide Fund for Nature (WWF)-ICRISAT Dialogue Project based at ICRISAT, Patancheru. • Rice is the main source of directly consumed calories for about half the world’s population and 90 per cent of it is produced and consumed in Asia. • Contrary to popular belief, rice is not an aquatic plant and the main reason it is submerged in water is for controlling weeds. • Conventional method of rice cultivation uses 60-70 kilos of seeds per hectare, SRI requires just five kilos per hectare. The SRI method ensures that the rice plants’ roots avoid saturation. 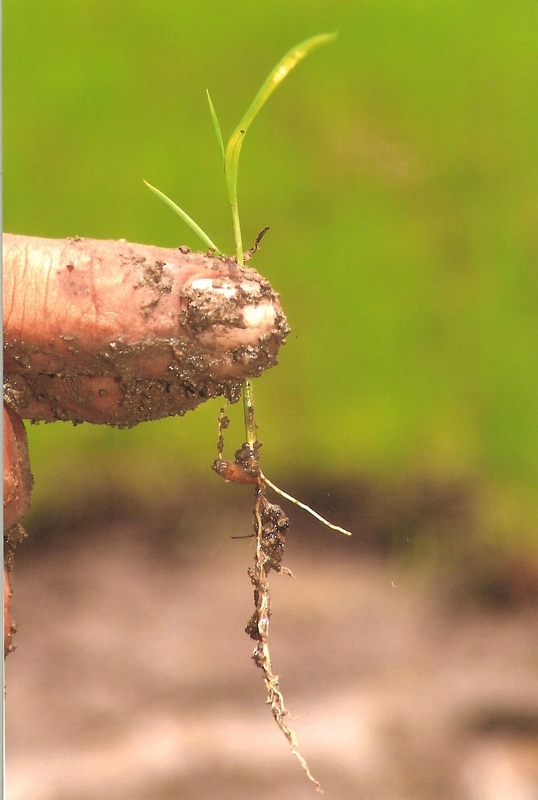 Young rice seedling with roots, seed and soil mass intact. 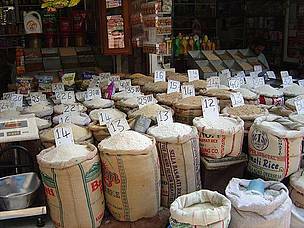 If the SRI method is applied to 20 million hectares of land under rice cultivation in India, the country could meet its food grain objectives of 220 million tonnes of grain by 2012 instead of 2050.